Masterwort is a large perennial plant; the large fleshy rootstock produces a stout, grooved, woolly stem, often 2 inches thick at the base and 3 to 8 feet high. The thin, hairy leaves are ternately compound and have broad, irregularly toothed leaflets. 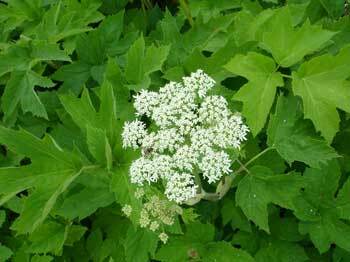 Large, compound umbels of dull white or purplish flowers appear during June and July. Seeds are flat and blackish, bigger than Dill seeds. Grows on wet ground in Canada and the northern half of the United States. Masterwort is under investigation for treatment of psoriasis, leukemia, and AIDS. This plant resembles Angelica and care should be taken in identification of the plant before use. The root of masterwort is hotter than pepper. A decoction of masterwort rootstock or seed used for colds, fever, asthma, dyspepsia, colic, dropsy, gout, epilepsy, palsy, apoplexy, expel gas from the bowels, increases the flow of urine, gravel in kidneys, scanty menstruation with painful cramps, and spasmodic problems. Externally, as a wash for wounds, sores, bruises, and ulcers. Infusion: take 1 to 2 tsp. in a cup of water per day. Powdered root: 1 tsp. per day. Fresh foliage can produce dermatitis in susceptible individuals. Cattle are reported to have been killed from eating the foliage. Acrid sap can cause blisters on contact.